Cuban Cigars - Cuban Box Codes Evolution. Starting from 1985, a cigar smoker could find a specific box code on a Cuban cigar box. Isn't that wonderful, friends? But let us explain why. 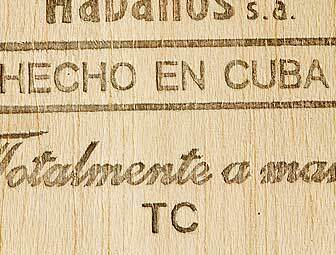 Did you know that until that year, cigar boxes were almost plain and bore only one stamp - the proud inscription Hecho en Cuba. Sometimes, in a very rare case, one lucky man could find a handwritten date which was made by a dealer. The then-president of Habanos S.A., Francisco Padron, has become widely known for his decision to start identifying factories and cigars. 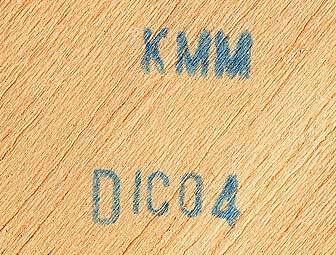 In 1985, the following information started appearing on a cigar box: information about the factory which produced the cigars, the month and the year of their release. And, therefore, we have received the opportunity to know more about our favorite cigars, though, this information was encrypted. The encoding, which determined the factory a cigar box came from, contained two or three letters which stood for the post-revolutionary factory names. For instance, the acronym FPG OAUC signifies that certain cigars were produced at the Partagas factory in June, 1987. Did all of you know that the factory established by Haime Partagas in 1845, is mentioned in the Cuban history under the name of Francisco Peres Germana, a Cuban revolution hero which is responsible for the first three letters in the above-mentioned acronym FPG? It is interesting to know that box numbers were used for internal purposes only. For example, if a box contained defective cigars, the code could always give information about the factory it has been manufactured at. In fact, the Spanish words used to encode such information - the Nivel and the Acuso mean Level and Accused in English. At that time, numerous complaints about poor quality of Cuban cigars forced Cuban authorities take measures against irresponsible workers and punish any person guilty of defective goods, even if it was a superior. One more reason why Cubans started encoding dates was to determine the time the crop was harvested, since its quality varied from one year to another. However, such things are hardly to hide from professionals, as well as regular smokers who could find that information too. It is evident that none of us would be eager to smoke low-quality cigars. It also happens that local factories could sometimes have limited access to Vuelta Abaho plantations due to the lack of transportation. Therefore, such factories are forced to use local tobacco which results in second-rate cigars. If you ever find out that certain information on your box has been coded during manufacture, you could stay positive that they wanted to hide something important from you, often negative. However, it could also be a secret blend or a special technology which cannot be revealed to anyone, except for the manufacturers. Some producers from other countries, like Dunhill, for example, besides encoding their boxes with such information as the point of production, would also mention the roller, the sorter and the controller responsible for the quality of your cigars. At this point, an irresponsible person would never remain unpunished. This first encryption system was valid for almost fourteen years. It was, probably, due to the fact that a few foreign tourists visited the Cuban Island at that time, except for the workers and militaries from the ex-Soviet Union. However, after its disintegration, Cuba stopped getting financial assistance from them, forcing Cuban leaders finding new ways to maintain the state. At first, they opened their frontiers, making Cuba an attractive place for visiting which still remains the main source of Cuban government revenues. The tourists (mostly consisting of cigar aficionados) could have finally disclosed the meaning of the enigmatic box codes while visiting Cuban factories and organizing the information they received. In December 1998 this information appeared in the Internet and Habanos decided to change the codes and outwit those who wanted to crack them. The information about the box coding has somehow leaked to the Internet in 1998, on the New Year's Eve. After this incident, Habanos changed their codes, getting over those people who tried to crack them. 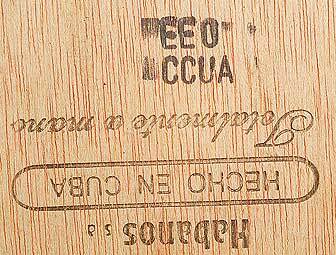 To change their previous coding, Habanos chose the phrase Codigo Uneta as basis. The first word stands for the English word code, and the second is the acronym of the organization which has been controlling the work at the factories - La Union de Empresas Del Tabaco de Cuba in the past, currently known as Tabacuba. In order to keep the 5 letters format, the word Codigo has suffered a change and lost the last letter "o". At the same time, the matching order of letters and figures has changed as well: the word Codig corresponded to the figures in the following way - 98765, while the word Uneta - to the figures 01234. Thus, the decoding word came as a little bit strange: Netagidocu. Moreover, the date has been previously stamped in the format "MMYY", but after the rearrangements this order has changed in the following way: the first two symbols signified the last figures of the year, and last ones - the month. Another innovation was introducing a three letter abbreviation to encode the place of cigar manufacturing. The first letter should necessarily indicate the province the cigars came from. As a result, the letter "E" signified the Havana factories, "T" stood for the factories of Havana province, "O" defined the Cienfuegos province, "N" - the Granma province, "U" - the Houlgin province, "G" - the Pinar del Rio province, "C" - the Sancti Spiritus province, "D" - the Villia Clara province, and, finally, "A" - for the Santiago de Cuba province. Let's demonstrate it on a real example. If the stamp on the Montecristo Especial box reads EAT CCUE, it means that these cigars were made at the Partagas factory in February 1999. However, the new ciphering has lasted only four months. After this information was cracked for the second time, and the key has appeared at the website www.cigarnexus.com, Habanos authorities were forced to replace the coding for the third time already. You are now probably wondering, what happened to their system again? Nothing criminal this time, we can assure you :) - Cubans decided to stop hiding the date of manufacture, revealing it to the world: the first three letters of the month (in Spanish) and the two last numbers of the year. Currently, a factory code contains from two to four letters and could change from time to time. The cipher is determined with the help of a computer, sometimes causing problems, since two factories could get similar codes at the same time. Therefore, it became much more difficult to identify the factory and the city the cigars came from. Obviously, such disorder has caused obstacles for everyone, even for the inspectors who cannot always get clear information on the stamps in time, in order to discover those who manufacture low-quality cigars. Our only way to keep up with Habanos is to visit all Cuban factories and try to decipher the codes every few months. One more way is to ask Sonya from my-cuban-cigars.com to answer your questions, we are sure she would be of great help to all of you. Verified: the draw is good! Before you start reading another article at my-cuban-cigars.com, please arm yourself with patience and continue reading this one. We have something else to reveal for those who care about the quality of their cigars. 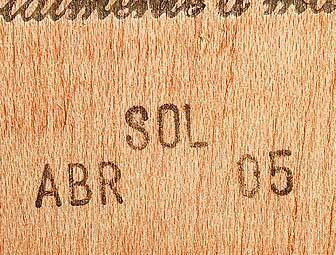 Besides the mentioned above stamps, you could also find one more at the bottom of a cigar box - the word revisado which means "checked" or "verified". Let's see how it happened to get on the box. To celebrate the new millennium, Cuban officials came to a decision to release two hundred million cigars which was unusual for Cuba, as the republic hasn't produced so many cigars since Revolution. However, nature decided in its own way: the 1999 harvest was really bad, resulting in a low-quality tobacco. Anyway, Habanos released the large amount they planned, adding complementary lines of unskilled sorters and twisters with low qualification, since all professionals has been working hard by that time already. Eventually, from two hundred million cigars only one hundred forty five cigars were sold, the others remained at the warehouses for several years. The smokers around the world found out about the bad crop, refusing to buy such cigars. Moreover, even official distributors rejected buying cigars from the 2000 harvest. After they understood that the remaining cigars won't be sold, the Habanos S.A. authorities decided to give them a second chance. The tobacco quality couldn't be changed but they could still fix technical issues. They opened each box, verified cigars' draw, blend and taste, put efforts to liquidate the drawbacks and "repair" it. If a cigar could be revived, it was put back into the box, otherwise, they destroyed it. Thus, each box that has been checked was marked with a Spanish word revisado, which was a warrant for smokers that all defects were corrected and cigars from such box could be smoked. Please note that when they open a box for a check, the old warrantee seal is cut and then resealed with a new one above. To find out more about Cuban factories, please read our article "Box Codes: Why Do We Need Them?"